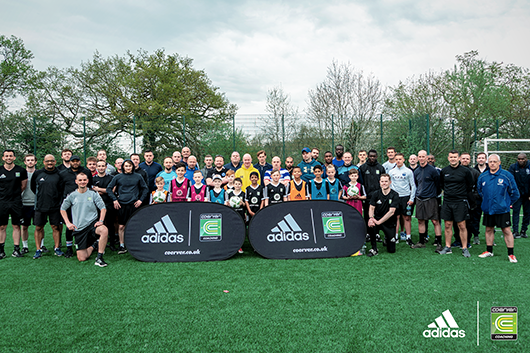 May 2018 saw the launch of the latest Coerver® EW tutorial in partnership with Match! Magazine based on Brazil and Liverpool striker Roberto Firmino. 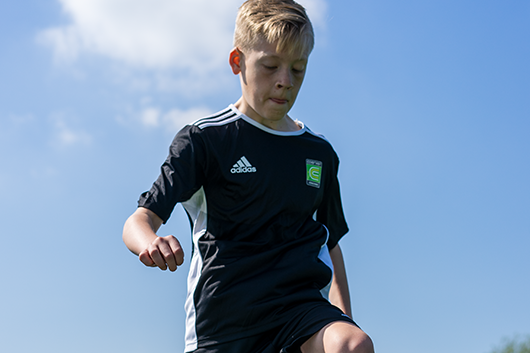 The “Unlock Agility like Firmino” content features Coerver® West Midlands Performance Academy players, Louis Harris and Dan Cooper who put the latest adidas® NEMEZIZ 17.1 Deadly Strike Pack boots through their paces during the challenge. You can see the full tutorial over on the Match! Academy website. SL Benfica host 2018 Coerver® EW Coach PRO Tour! On the 10th May 2018, 20 coaches from the Coerver® Coaching England and Wales network travelled to Lisbon, Portugal to participate in the 2018 Coerver® EW Coach PRO Tour. 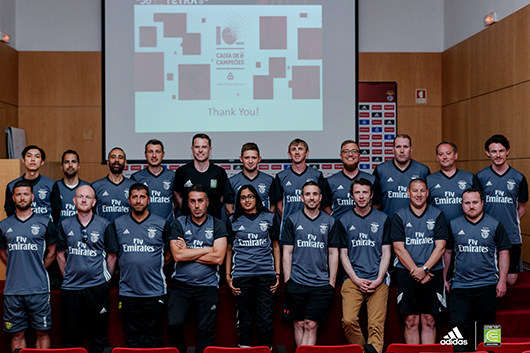 Coerver® Coaching’s Global Youth Development partner, SL Benfica, opened the doors to their academy to provide a comprehensive behind the scenes study visit at what is one of the most successful player development setups in the world. In content-packed weekend schedule, SL Benfica provided the PRO Tour with a truly first class experience from the first minute to the last. 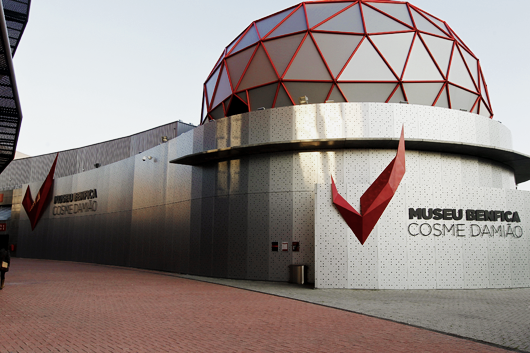 Friday 11th May saw an early departure as the PRO Tour spent the entire day at SL Benfica’s world class academy facility – Caixa Futebol Campus. First on the agenda was observation of the U19s final training and preparation ahead of their Saturday evening game against Sporting CP. Attendees were then provided with a full tour of the campus which includes 6 grass pitches, 2 artificial pitches, player accommodation and, most notably, the revolutionary 360s simulator. 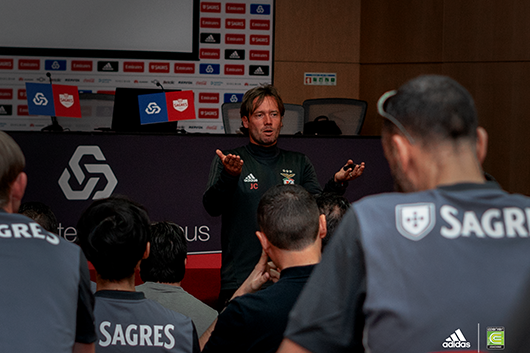 Final events at Caixa on Friday saw key SL Benfica academy staff deliver presentations on the club’s philosophy, player development, scouting and sports science followed by observation of the U16 boys training session. Day 2 of the PRO Tour provided the opportunity to observe what happens on the training pitch in competitive games. The first game saw SL Benfica’s U23 men take on FC Porto. After a tight 0-0 first half between two highly technical teams, Chris Wilcock – a recent signing from Arsenal FC – proved the difference between the two sides as Benfica raced to a 3-0 win. The second game of the day was the highly anticipated U19s match between SL Benfica and Sporting CP. In front of a crowd of nearly 1000 people, João Félix – widely regarded as SL Benfica’s next star, put in a great performance and contributed with 2 goals in a 3-1 victory. The final PRO Tour day was dedicated to the first team. 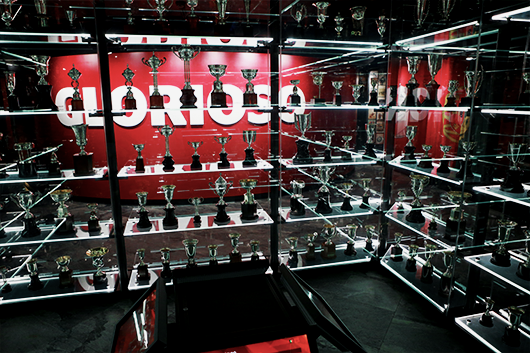 In the morning, attendees were given a full tour of SL Benfica’s stadium – Estádio da Luz and included a visit to the club’s newly updated history museum and lunch in the stadium’s corporate suite. The 2018 Coach PRO Tour concluded on Sunday evening with a return to Estádio da Luz for SL Benfica’s final league game of the season – a game which saw them secure a place in the 2018-19 Champions League qualification stages with a 1-0 win over Moreirense FC. “The 2018 Coach PRO Tour is the second trip that we have been able to offer members of our network following on from the trip to Real Madrid CF in 2016” said Coerver® EW Director, Scott Wright. To see images from the 2018 Coach PRO Tour click HERE. 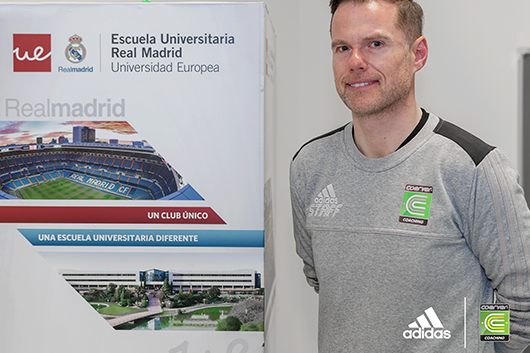 Saturday 17th March 2018 saw Coerver® England & Wales Director, Scott Wright head back to Madrid to lecture at the Real Madrid University for the fifth consecutive year. The MSc in Talent Identification and Development in Soccer Course, which is held at the Villaviciosa de Odon campus, is ran in joint partnership between the European University of Madrid (Universidad Europea) and the world’s biggest football club, Real Madrid CF. The prestigious course provides students with access to some of the leading organisations within world football – AFC Ajax, Borussia Dortmund, GNK Dinamo Zargreb and Sevilla FC are just a handful of top level clubs that have presented on the course recently. 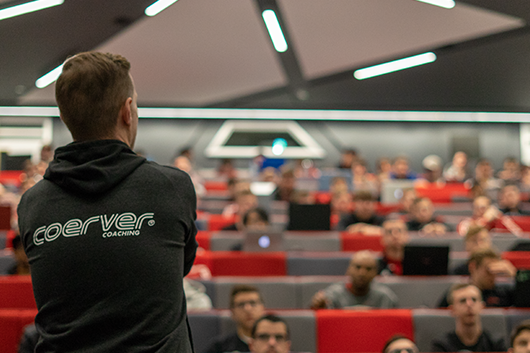 During the 1-day class, Scott presented both theory and practical sessions aimed at providing the students with an insight into the evolution of Coerver® Coaching since being founded in 1984. 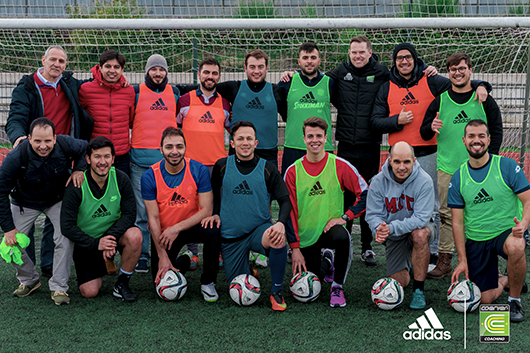 February 2018 saw 130 Coerver® EW Performance Academy, Partner Club and staff members travel to the Spanish capital city of Madrid for the 2018 Coerver® PRO Tour. 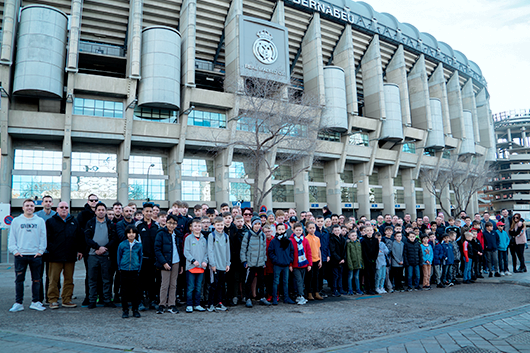 Held across 4 days, the PRO Tour provided attendees with an incredible behind the scenes insight into two global football super powers – Real Madrid CF and The Royal Spanish Football federation. After landing on Friday evening and a full player / parent meeting ahead of the weekend’s events, PRO Tour Saturday was split into two main segments. Saturday morning saw the PRO Tour head north from our hotel base in Alcobendas to La Ciudad del Fútbol de Las Rozas – the headquarters for all Spanish national teams. Here, our players participated in a 90-minute training session with Spanish FA coaches. Following the session, the PRO Tour group had the opportunity to visit the Spanish national football museum which is also situated on site. Here, attendees could absorb the rich Spanish footballing heritage – from classic football kits to medals and success including seeing the 2008 & 2012 European Championship and 2010 World Cup winning trophies. After a quick return to base for lunch, the PRO Tour made the short journey into Central Madrid and to the Santiago Bernabeau to watch Real Madrid CF play in their La Liga fixture against Real Sociedad. Here, attendees were treated to a master-class from the Galactico’s who put in a comprehensive 5-2 winning performance. 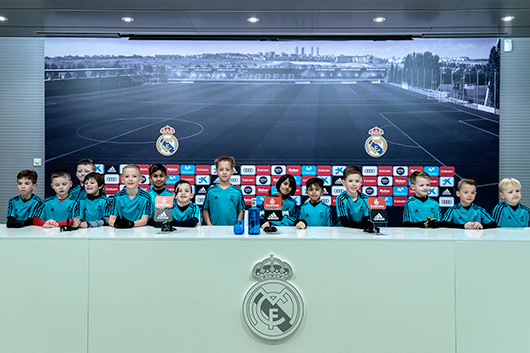 Sunday morning saw the PRO Tour return to the Bernabeau for the full Real Madrid stadium tour which included visiting the home team changing room – the very same changing room where Zidane’s winning side had celebrated their victory in only hours earlier! Monday was the last day of the trip but the one everyone had been waiting for. Following a short 10-mimute drive from the team base, the PRO Tour arrived at Ciudad Real Madrid in Valdedebas – Real Madrid CF’s purpose built training complex. Here, the PRO Tour players participated in two 90-minute training sessions that were delivered by Real Madrid CF full-time academy staff. “The 2018 Coerer® PRO Tour has been the best tour that we have delivered to date” said Coerver® EW Director, Scott Wright. “It’s just amazing and I think that every kid that is given the opportunity to do it then they should take it” [attend a Coerver® PRO Tour]. 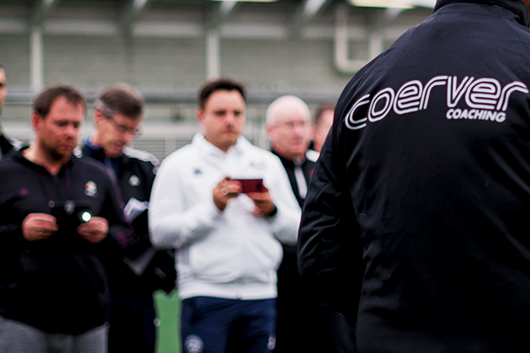 The Coerver® PRO Tour is an annual event accessible to members of the Coerver® England & Wales network. Coerver® EW head to S.L. Benfica for 2018 Coach PRO Tour! On Thursday 10th May 2018, the Coerver® Coaching England & Wales Coaches PRO Tour heads to our global youth development partners, SL Benfica. 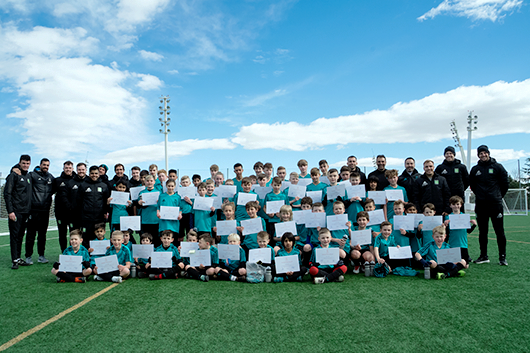 Coaches from the Coerver® EW network travel to Lisbon to visit one of the game’s most famous clubs with a fantastic tradition for developing young players through their world-renowned academy. As part of the tour, attendees will have the opportunity to participate in a number of activities. 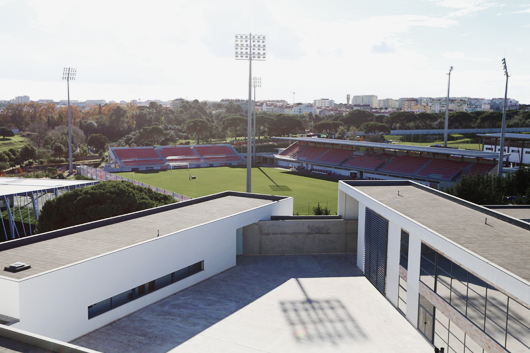 These include a full behind the scenes tour of the world-class training facilities at the Caixa Futebol Campus (home to all SL Benfica teams), observation of SL Benfica academy training session/match and a full tour of Estádio da Luz Stadium & museum – the home of SL Benfica. During the tour, SL Benfica will provide full access to their academy staff with a philosophy presentation and various coach interaction/workshops scheduled for the trip. 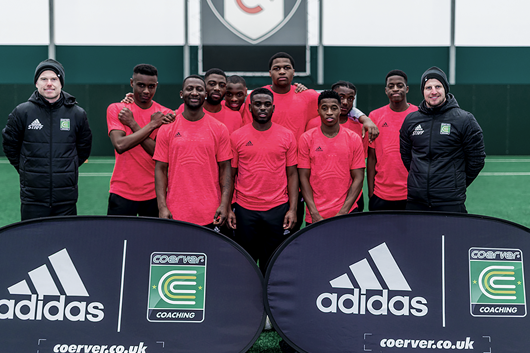 On Wednesday 28th February 2018, Coerver® EW Director Scott Wright & Head of Coaching, Luke Cheyne, travelled to London to deliver a “Train Like A PRO” day with adidas® UK Tango League Champions, The K5’s. 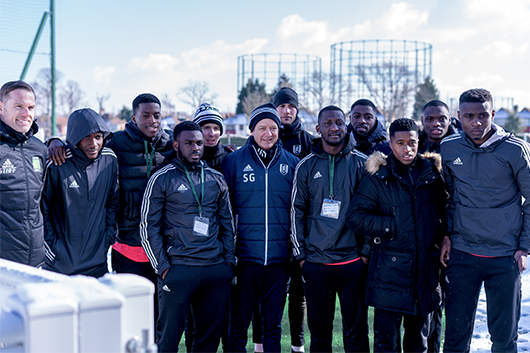 Hosted by adidas® partner club, Fulham FC, the 9-strong squad were given the opportunity to experience a day in the life of a professional footballer. In the morning, the group were given exclusive behind the scenes access to Craven Cottage – the home of Fulham FC since 1896 and one of the last remaining ‘traditional’ grounds in the country. After a short transfer, the Coerver® team and The K5′s headed to Fulham FC’s Motspur Park training ground where they observed a full, first team training session as the Cottagers prepare for their crucial Championship clash with promotion rivals, Derby County tomorrow. Following the session, First Team Coach Stuart Gray and Norwegian international midfielder, Stefan Johansen, took time out for a Q&A with the squad. 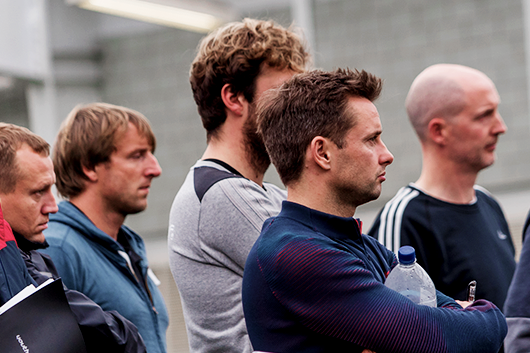 In the afternoon, Coerver® EW delivered both theory and practical sessions for the group. This began in the classroom with a workshop based on the mental and physical aspects of the game. 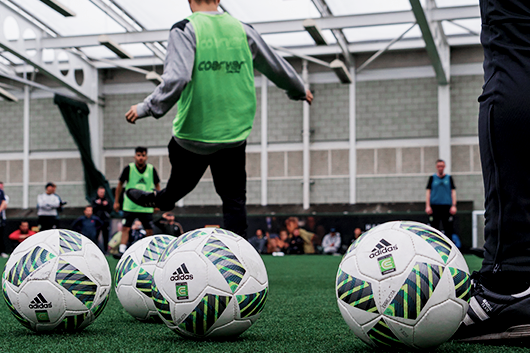 The day finished with a Coerver® practical session in the Fulham FC academy dome. 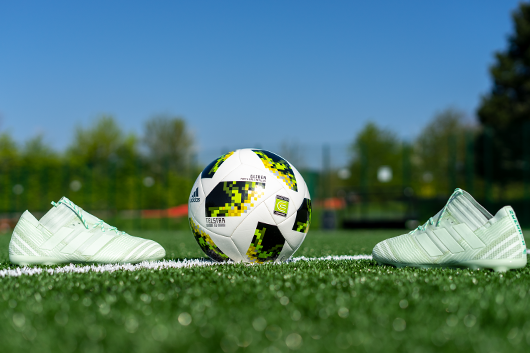 “Together with our partner adidas and Fulham FC, the K5’s tango league squad have had an amazing opportunity to learn what it takes to train like a pro” said Scott. Our behind the scenes video & media will be released next week across all @CoerverEW social media platforms. Coerver® EW are pleased to announce details for the upcoming Youth Diploma 1 courses due to take place in London & Manchester during Summer 2018. 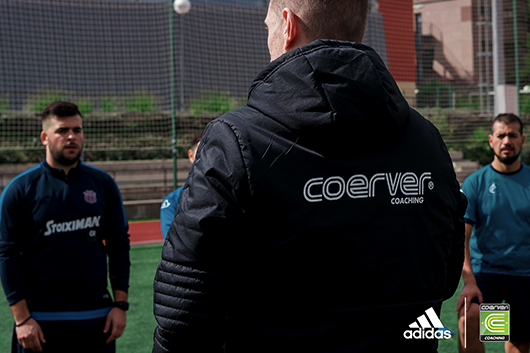 The Youth Diploma 1 course forms part of the Coerver® Coach Education Pathway, which provides coaches with the opportunity to attend up to 5-days of official Coerver® coach education. The pathway consists of three courses which are made up of the Coerver® Intro (1-day), Coerver® Youth Diploma 1 (2-day) & Coerver® Youth Diploma 2 (2-day) respectively. 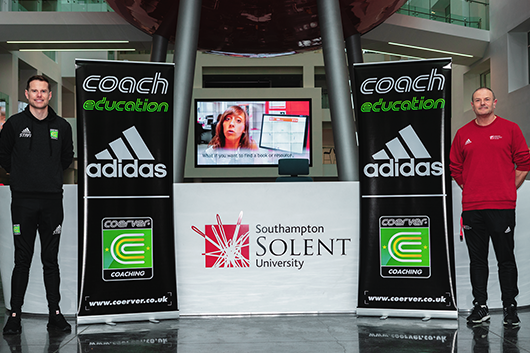 The pathway has been designed to give attendees a greater understanding of the history and evolution of the Coerver® programme, both on and off the pitch over the last 34 years since being founded by Alf Galustian and Charlie Cooke in 1984. 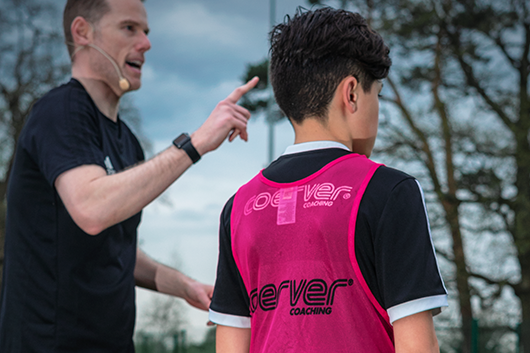 The Youth Diploma 1 is designed to provide attendees, regardless of the level that they coach at, with a greater understanding of how to plan & deliver more effective coaching sessions, utilising the Coerver® Session Planner. Scott Wright, who is able to draw from experience in delivering Coerver® Coach Education courses at all levels of the game, across the globe since joining the organisation in 2005. “We are really looking forward to delivering this year’s Youth Diploma 1 courses in London and Manchester respectively” said Scott. 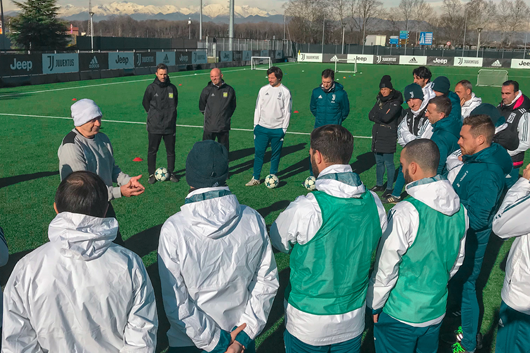 Elite Coach Education clinic at one of the world’s greatest football clubs and current Italian champions – Juventus FC. 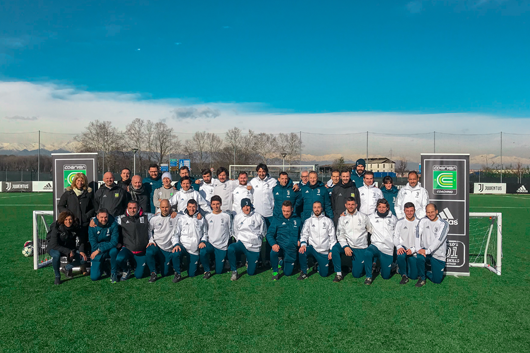 The clinic was hosted at the Juventus Centre, the training base for all Juventus teams and was attended by all Juventus academy coaches. In addition, Technical Director, Stefano Baldini and Gianluca Pessotto, team manager of Juventus Youth Teams and a former first team Juventus FC player and Italian international were also in attendance. Attendees on the day included several ex-professionals including 2006 World Cup Winner Simone Barone. FIFA committee member and Italy’s greatest female player, Carolina Morace, was a also special guest participant to the clinic. Alf delivered both Coerver® theory and practical sessions focusing on the link between ball mastery and the team game which was very well received by all in attendance. 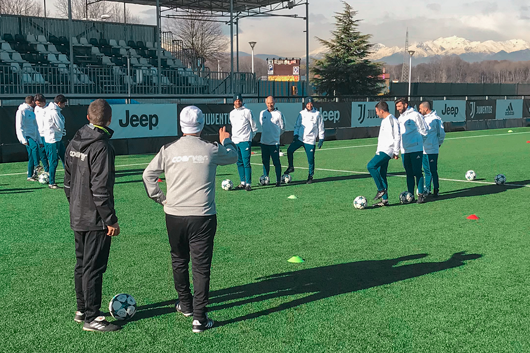 “It’s an enormous honour for Coerver Coaching to be invited to work with Juventus FC who are without doubt, one of the truly elite football clubs in the world” said Coerver® England and Wales Director, Scott Wright.